Plantains are starchy green bananas or cooking bananas that belong to the Musa genus and can be eaten ripe or unripe. They are harvested unripe when nearing maturity. They are low in sugar and are usually fried or baked. Here is a plantain vs. banana comparison based on few points. Plantains resemble green bananas, but when they ripen, they turn black and are used as a vegetable. Bananas have a thinner skin, and when ripe, they turn yellow. Plantains have a thicker skin, natural brown spots, and rough areas. Fresh plantains have more vitamin C, vitamin A, and potassium than bananas. Plantains are starchy, while bananas taste sweet. The size of a plantain and banana also differ, as plantains are usually longer than bananas. Below we give a more detailed comparative analysis of plantain vs. banana in terms of their nutrition content and health benefits. Are plantains good for you? Or, are bananas good for you? Which one is better? Keep reading to find out. A 100-gram serving of plantain has 116 calories. It has 31 grams of carbohydrates consisting of 14 grams sugar and two grams of dietary fiber. The same serving has one gram of protein and provides 18% of the recommended daily intake of each of vitamin A and vitamin C, and three percent of calcium. Plantains have good amounts of potassium, magnesium, and phosphorous. 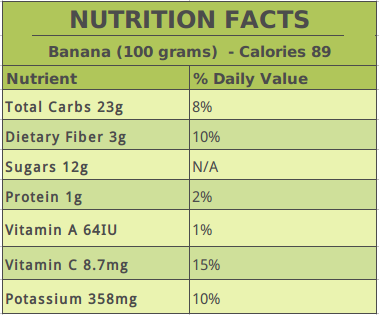 A 100-gram serving of raw banana contains 89 calories. It contains one gram of protein and 23 grams of carbohydrates consisting of three grams of dietary fiber and 12 grams of sugar. It provides 15% of the recommended daily intake of vitamin C, and one percent each of vitamin A, iron, and calcium. There isn’t much difference in the sugar content of a plantain and a banana, but the sugar content increases as the banana ripens. Bananas have more omega-3 and omega-6 fatty acids compared to plantains. Although the difference in magnesium and phosphorous content in plantains and banana isn’t much, there is a significant difference in the potassium and vitamin A content. Bananas have 358 milligrams of potassium and one percent of the RDI of vitamin A. Meanwhile, plantains have 465 milligrams of potassium and 18% of the RDI of vitamin A. Potassium helps maintain proper working of muscles and prevents muscle spasms. The glycemic index (GI) estimates how likely a particular food will increase blood sugar levels. The glycemic index of plantain and banana is 40 and 52, respectively. 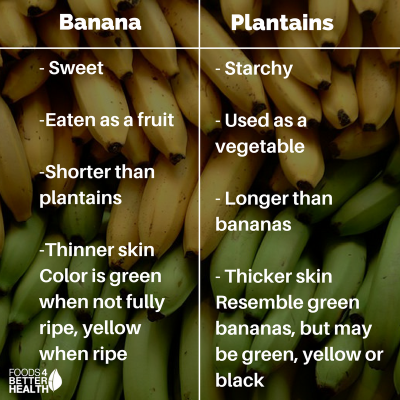 Despite the small differences between them, the following plantain vs banana comparison shows both have ample health benefits. Ripe bananas have a high glycemic index and are easy to digest since the starch in them changes to sugar. Ripe bananas have higher antioxidants and they produce a substance called TNF (Tumor Necrosis Factor). According to a study conducted in Japan, TNF may act as an anti-cancer agent by stimulating the production of white blood cells (leukocytes) and killing abnormal cells. Bananas have a good amount of fiber and help to prevent constipation, bloating, and other digestive symptoms. According to the Journal of Pharmacognosy and Phytochemistry, a banana can boost your energy. The natural sugars such as sucrose, fructose, and glucose present in bananas give instant and sustained energy. Bananas contain tryptophan and can help fight depression. According to a study published in the International Journal of Tryptophan Research, tryptophan is a type of protein that the body converts into serotonin, which improves the mood and makes one feel happier. Bananas should be consumed by anemic people as they stimulate the production of hemoglobin in the blood. The potassium in plantain and banana helps boost brain power and regulates blood pressure. According to a study published in Physiologia Plantarum, potassium lowers the risk of stroke, osteoporosis, and renal diseases. According to research conducted at the University of Kentucky’s Department of Internal Medicine and Nutritional Sciences Program, plantain can relieve constipation and provide relief from digestive system conditions like diverticulitis and hemorrhoids. Bananas and plantains have a good amount of vitamin C that helps fight free radical damage. In addition, vitamin C has many health benefits such as in immunity building and the strengthening of bones, among others. Plantains have a good amount of vitamin A, which enhances skin health, eye health, cell growth, and boosts the immune system. A study published in the International Journal of Research in Pharmaceutical and Biomedical Sciences shows that dried plantain powder has an ulcer-healing effect on an aspirin-induced gastric ulcer. Bananas that have dark patches are better immunity enhancers. Also, on a side note, those people who use nonsteroidal anti-inflammatory drugs for rheumatoid arthritis and chronic pain, have a high risk of developing ulcers in the membrane layer of the stomach. Dried plantain stimulates the growth of the inner lining of the stomach. Look for plantains that are heavy and firm, mature, deep green, and well-formed. They can be stored at room temperature for four to five days. Avoid buying overripe, damaged, or split fruit. Raw plantains must be eaten only after cooking as they contain starch. To prepare plantain, wash it in cold water and pat dry. Trim both ends and cut the fruit into short lengths. Peel the skin gently away from the flesh. You may have to do this with a peeler, unlike that of a banana skin. A plantain can be used as a replacement for potatoes and can be grilled, mashed, baked, or fried. In Southern India, plantain and banana chips seasoned with salt and pepper make a great snack. Plantains are also used to make vegetable preparations. They are used to make tostones, which are similar to plantain chips and eaten as a snack in the Caribbean islands and Latin America. Plantain flower heads, their interior icicle-whites, and its tender stem are also used to prepare a variety of recipes in Southern Asia. Plantains are steam-cooked for infants and the elderly. The whole fruit can also be barbecued with its skin. After peeling, the fruit can be cut into chunks and used in different cuisines. They can be dried and ground into flour and used with milk as an infant food. In Peru, boiled plantains are mixed with water and spices to make a drink called “chapo.” Plantains are also used to make a Caribbean soup called “sopa.” In the Dominican Republic, mashed plantains are served with beans, rice, eggs, poultry, or fish. The national breakfast of the Dominican Republic is mashed plantains served with fried onions. Once ripe, bananas are bright yellow, fragile, and have a rich, fruity aroma. They are sweeter than the unripe ones, and must be consumed in a short span of time. Bananas can be enjoyed alone as a snack, or can be added to fruit salads. They can also be used to prepare milkshakes, jams, and added to muffins, cakes, casseroles, and bread pudding. In Caribbean desserts, grilled bananas are served with ice cream or cakes. Before you consume plantains or bananas, keep in mind the side effects. Plantains may cause gas, bloating, and flatulence if eaten in excess. Type 2 diabetics must avoid consuming ripe bananas due to the high sugar content, or eat them in moderation upon consulting a doctor. 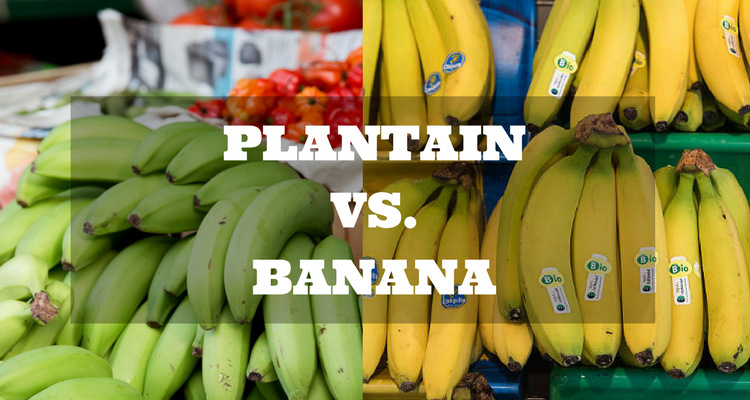 After the plantain vs. banana comparison, we can say that both have almost similar nutritional content and health benefits. So, eat either fruit for overall good health. Depending on how you want to consume the fruit, go for plantain if you want the cooked version. Otherwise, just eat a ripe banana as a snack—it’s always better than reaching out for junk. Plantain vs banana … which one will you choose? Can Eating Too Many Bananas Adversely Affect Your Health? Are Bananas Fattening or Good for Weight Loss? Are Bananas Acidic or Do They Help Reduce Acid Reflux? 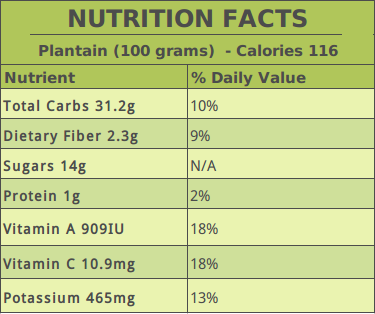 “Plantains, cooked Nutrition Facts & Calories,” SELF NutritionData; http://nutritiondata.self.com/facts/fruits-and-fruit-juices/2031/2, last accessed March 9, 2017.